This little guy’s name is Elvis. He’s a real sloth at the Sloth Institute in Costa Rica. He was rescued as a baby and is currently preparing to be released into the wild! In this original oil painting on board, he’s adorned with orange and yellow roses as he grips a golden tree branch. 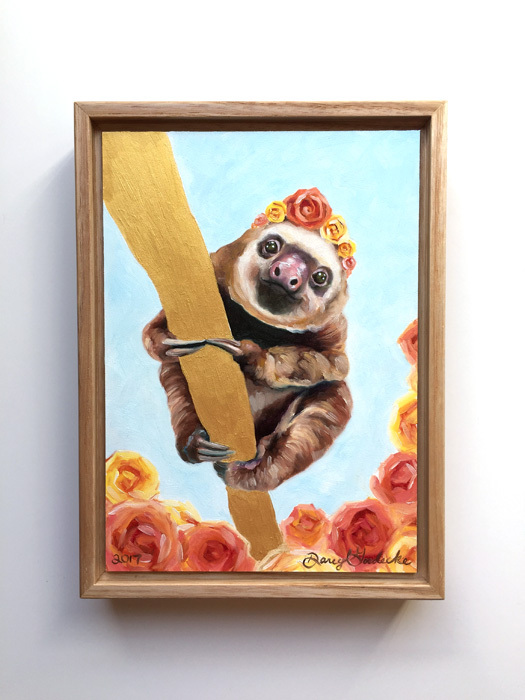 $15 from the purchase of this painting will be donated to the Sloth Institute to continue their mission of studying and conserving wild and rehabilitated sloths! The Sloth Institute of Costa Rica is a non-profit focusing on the research, education and release of hand-raised sloths back into the rainforest. They promote the importance of keeping sloths wild, not as pets. If you see a sloth in the wild or in captivity, keep your distance! Handling or approaching sloths cause them extreme stress! Thank you to the Sloth Institute for the use of this photo! Please allow up to a week for delivery of this painting within the US.